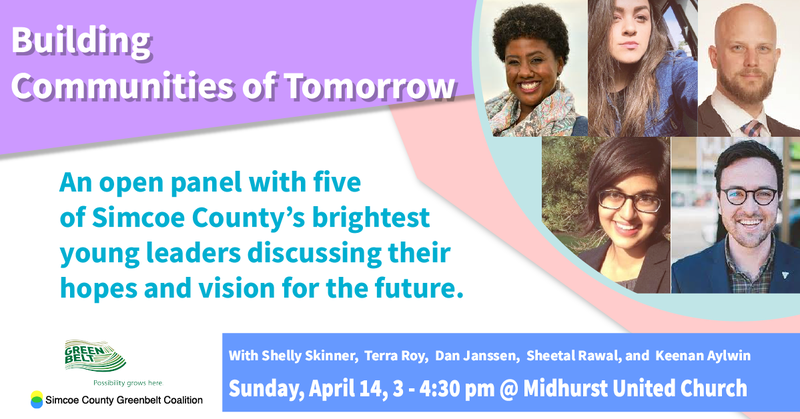 The Simcoe County Greenbelt Coalition (SCGC) is hosting a panel of young leaders this Sunday, April 14, to discuss challenges in the community and how to build positive change for the future. 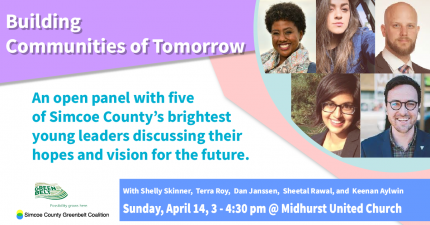 The panel event will run from 3 p.m. – 4:30 p.m. at the Midhurst United Church. Check out the Facebook event here for more. Before the panel, at 2 p.m., the SCGC’s Annual General Meeting will take place, where they will be ratifying their constitution and voting on board members and directors. For those interested in participating as an SCGC member, which allows you to vote, nominate and stand for a position, you can become a member by attending and completing the form and purchase, or you can sign up now online here.